I was given a pink stuffed bear when I was about four or five years old 1988 to 1990. It had one yellow ear one blue ear in the bottom paws were yellow and blue as well I lost the stuffed animal back in 2008 or 2009. I don't know the name of the company that made it and I haven't been able to find any information on it online on its stomach and a picture of cherries on it. It's not a Care Bear and any information that I put on Google has come up with only showing and Care Bears. 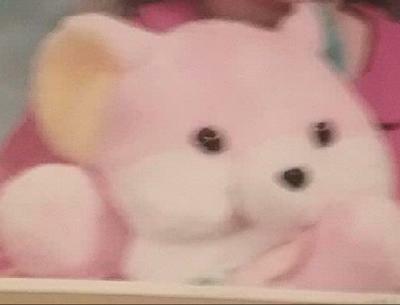 Any information that can lead to finding the name of the company or the bear itself would be greatly appreciated. I have spent many years trying to find any information and I haven't been able to you stuffed animal means a lot to me it was given to me as a gift from my grandmother and she meant the world to me unfortunately she is no longer alive so I would really like to be able to replace the bear that I had. Once again I would be very grateful for any information regarding this.